Is Guardians of the Galaxy 3 Getting a New Director? Yesterday was a big day for fans of the Marvel Cinematic Universe. Director James Gunn went on Facebook Live with Chris Pratt to announce that they were officially wrapping on Guardians of the Galaxy Vol. 2. While this is very exciting, all eyes already seem to be on the possibility of Gunn returning to do a presumed Guardians of the Galaxy Vol. 3, and we already have a clue as to whether or not James Gunn will be back. James Gunn and Chris Pratt made their announcement via a Facebook Live video on the director's official Facebook, and as anyone who follows him on social media knows, he is very active and interacts with fans a lot. Almost immediately after the broadcast, a fan posted in the comment section asking Gunn "When do you start on Vol.3?" Here is what he had to say. "I'm not yet sure whether I'm going to do Vol 3." A huge tentpole movie like Guardians of the Galaxy takes a very long time to make and requires a lot of time on the part of the director. Gunn has pretty much been working on Guardians in some capacity for more than four years now, and won't be done with Vol. 2 until next year, so the idea of him not committing to a third installment just yet is understandable, especially when another comment he made in response to a fan on the same video us taken into consideration. When asked which of the Guardians movies was more difficult to make, here is what Gunn had to say. "This one was more emotionally exhausting." With Gunn saying he is already emotionally exhausted and still having to go through the long post production process on Vol. 2, his current position makes a lot of sense. Granted, once he is done with Vol. 2, it looks like it would be quite some time before he had to jump back into the world of Guardians, as Kevin Feige has said that a third movie is part of their plans, but it wouldn't be until Phase 4, which means it wouldn't likely be due in theaters until at least 2020. That would give Gunn a much needed break and some time to work on another project, as well as figure out if he wants to finish out the trilogy. Marvel will very likely want to keep Gunn around and happy if at all possible. 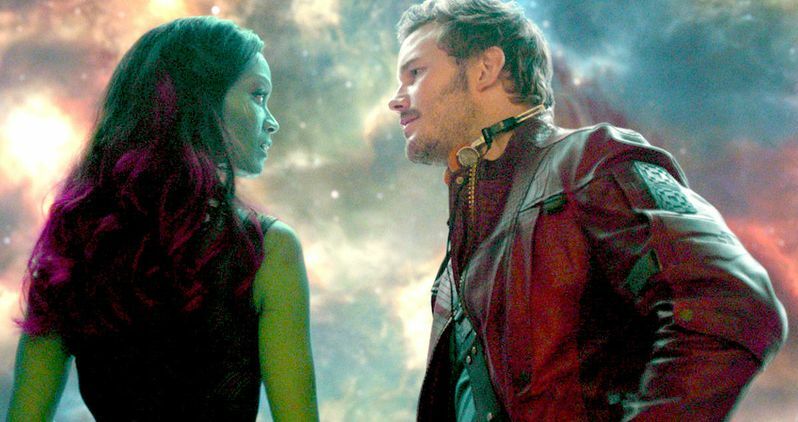 Granted, we haven't seen anything from Guardians of the Galaxy Vol. 2 yet, but he helped make the first movie a massive, surprising success for the studio in 2014. Many considered the property a huge risk and were predicting modest success, if not box office failure. Guardians went on to gross $773 million worldwide and was the highest grossing movie domestically that year. Not only that, but it launched an animated series, a Grammy award winning, best selling soundtrack, a ton of comic books and every other piece of merchandise you can think of. So, beyond the box office receipts, Gunn has helped create a huge property for Marvel as a whole. We don't know anything about Guardians 3 or if Gunn will be back, but we also don't really know that much about Vol. 2, so we will need to be patient. That is looking like it is going to change soon though, as Gunn and Pratt announced at the end of the Facebook Live broadcast yesterday that they will indeed be heading to San Diego Comic Con this year, and it sounds like they are bringing some footage with them. So, if you weren't already excited about SDCC or Vol. 2, that will probably help. Guardians of the Galaxy Vol. 2 is set for a May 5, 2017 release.